Payment options : credit and debit cards, e-payment. LoveMyLotto.com is a multi-syndicate online lottery organisation that was established in 2010 and operates out of Stratford-on-Avon, in the United Kingdom. 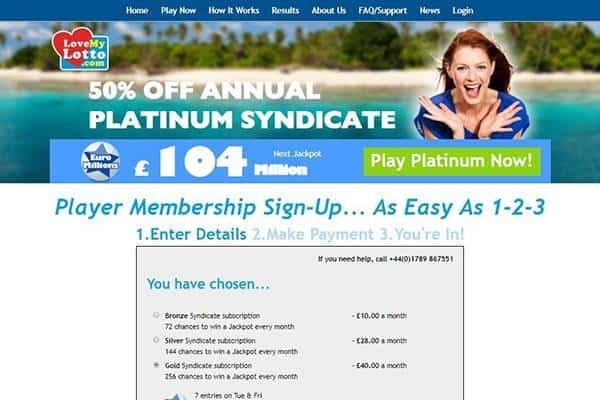 Since their establishment, the website has been able to serve thousands of members with only real 49’s, Euro Millions, and UK lotto daily tickets which are exactly the same as both bought by offline lottery players. The website buys their UK and Euro Millions Lotto tickets from outlets in Camelot, while they get their Daily Millions and 49’s Daily Draw tickets from William Hill. The company was founded by Brent Harding and John Wiley, who both have over 40 years of experience in the UK gaming industry, and also extensive experience in the Lottery, Casino, and Bingo industries. They have also acquired several gaming licenses signed by the UK Gambling Commission. This online lottery website offers users the opportunity to be among the people to share in the prize money advertised on 49’s, UK lotto, and Euro Millions’ official websites. But that’s not all, players also get an opportunity to have a part in the mega-raffle draws and million-pound raffle in the UK lotto and Euro Millions draws. As mentioned earlier on, LoveMyLotto.com is a syndicate lottery website, which means that a group of people with a common interest have rights to the ownership of a set of lottery tickets. On the website, these syndicates come in three levels – Gold, Silver, and Bronze, which cost £36, £24, and £12 monthly respectively. As each syndicate advances in its level, the higher the ticket it has ownership to, and of course, so does the cost. Individual syndicates are made up of 42 members sharing the prize money, and five lotteries – £1 million daily lottery, UK Lotto, Millionaire Raffle, Plus 5, and the Euro Millions – are involved in each syndicate package. And, if a syndicate wins the Lucky Dip Ticket attached to the UK lotto, it gets that extra ticket in the following week. By being a syndicate, this massively increases the chances of players to win all at a fraction of what it costs to play as an individual. 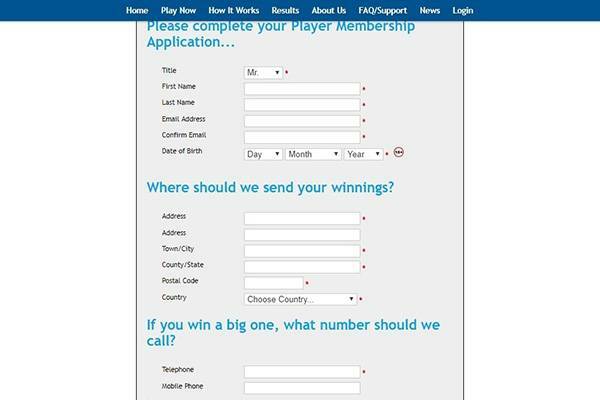 Also, the website scans the UK lotto tickets and the Euro Millions lottery tickets every weeks, and allows players view them in their secure account dashboard. But some might see this as a problem because, they would rather play as singles than be placed in a group or syndicates. Love My Lotto didn’t put in the effort in developing a mobile app – iOS or Android – but it does seem they put some thought intro their mobile view’s design. It’s not just a responsive website that fits small screen, but a well crafted code. The mobile view retains the same vibe and lottery options that the desktop view does. In short, while there’s no dedicated mobile website or a mobile native app, users on the go wouldn’t be disappointed. There is no new player bonus package or one time special offers for new players, but an on-going offer of up to 50% off on syndicate subscription. 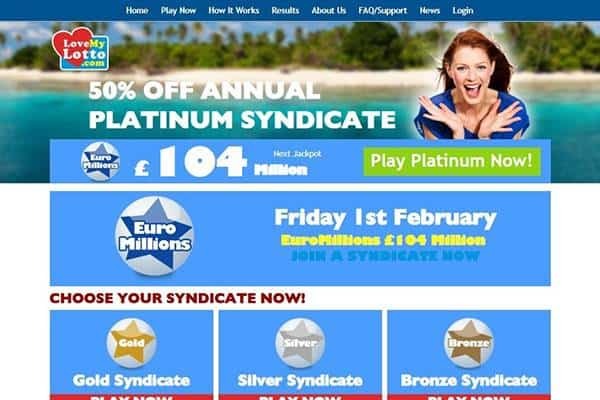 Each time a syndicate wins either a UK lotto, Euro Millions or any other draw, accounts of individual members of the syndicate are simply credited and emails are sent to each member to notify them of their winning. And, when they actually want to withdraw their winnings, the company issues out a check to them. There’s no FAQ page, but a dedicated sub domain with a cleaver customer support system. with a wide coverage of issues that many users might encounter and should know the answers to. It also includes well written lottery articles. In complete contrast to the “manual” customer support that is offered as part of the FAQ section, reaching actual customer support isn’t that intuitive. There’s a contact us form and… that’s it. Only a contact us form with no expected time frame for a reply or working hours. Is LoveMyLotto legit or fraud? 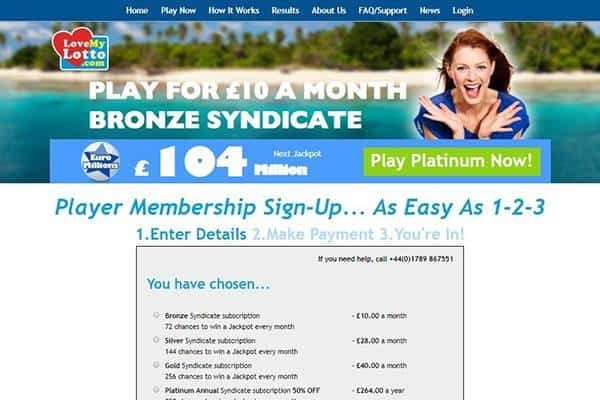 Joining a syndicate on LoveMyLotto is usually paid for monthly, and it depends on the level of syndicate you wish to join. There is sometimes a confusion between the UK Lotto and the Daily Lottery; while the UK lotto is handled by the UK National Lottery, the Daily Lottery is an internal draw. The only downside to playing on this website is the fact that there are no individual tickets available, instead players are placed into groups or syndicates. Love My Lotto has been around from over 6 years now, and they players amazing lotteries like UK Lotto, 49’s, and the Euro Millions draw. Once tickets own by a syndicate emerges as the winning ticket, players within the winning syndicate are notified via email, and their accounts are immediately credited with the amounts won after it has been shared. Also, the option to withdraw is available, where a cheque will be issued to the player. The website is a multi-syndicate lottery website that is still serving thousands of users till date. Running a syndicate program, after users register on the website and get attached to a syndicate which claims ownership for a group of tickets. These syndicates have three level – Gold, Silver, and Bronze – which have different monthly cost. However, this multi-syndicate site does not have the option of playing as a single player, making it a no-go area for lottery players that prefer playing as a single individual. One of the leading options for those who like playing lottery syndicates. Offers incredibly valuable bundles for those who use their subscription option. Mobile support is top notch with a complete brand matching experience – but on a smaller size screen.